If you have followed the blog for some time, you may have observed a slight shift in my overall aesthetic. While I have always advocated balance in building a wardrobe, I have truly started taking the mantra of " buy less, buy better" to heart. So while I don't buy as much as I used to, the items I do pick up now are at a higher price point than used to be the case. Here is where Tailor4Less comes in and my next statement will be important to keep in mind as you read through some of the details of this review. Tailor4Less offers the ability to create fully customizable garments at an affordable price. In the spirit of full disclosure and to drive home the point about affordability in relation to customization, had I paid for this unstructured suit with a double-breasted vest, colored functional button holes, a ticket pocket, embroidered name, pen pocket and a hidden card/cash slot in the waistband of the trousers? It would have cost me $415.85. Yes, you read that right. 416 bucks. There are mass-produced, off the rack jackets at Macy's that cost more than that. Tailor4Less promises delivery of your order within two weeks. I believe this suit arrived with a couple of days to spare. I started A Curated Man a little over two years ago to document and share the bits and pieces of knowledge I picked up as I decided to spend some time truly learning about the dynamics of dressing well and developing a sense of style based on an understanding and appreciation of those dynamics. As time has passed, I have developed a much deeper understanding of tailored clothing and suiting in particular. I have come to understand what to expect when one chooses between made to order, made to measure and bespoke. Now included in that mix are the various brands and companies offering custom or made to measure clothing through an online only format. I had my first experience about a year ago using an online configurator to design a jacket and a pair of shoes and hadn't really considered this option ever since. Mainly because I generally like to see, touch and try on garments whenever possible. However, when Tailor4Less reached out to see if I would be interested in creating a garment using their 3D visualizer, I said yes. I was curious to see how far the software had come and how the various options offered translated into a finished product. I really enjoyed playing around with the 3D visualizer. According to Tailor4Less, they offer about 1,500 options when it comes to customizing your order. They also offer a pretty broad range of choices for fabrics with the ability to filter by composition, tonality, texture and season. 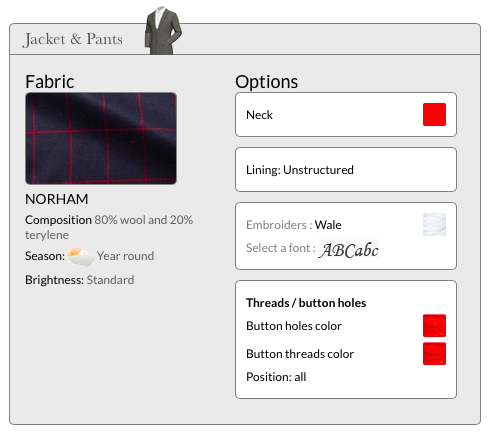 I selected a year round red and navy windowpane fabric called the Norham composed of 80% wool and 20% terylene. Terylene is a form of polyester usually added to give a fabric some durability. In retrospect I would have taken my time and requested some fabric swatches, which they offer at $1 each before placing my suit order as I wasn't the happiest with the texture of the fabric when the suit arrived. If you are like me about texture etc., I recommend taking advantage of this option that Tailor4Less provides as they offer everything from 100% merino wool to blends such as this. I will also say here that the fabric does feel pretty damn durable which I like a lot. Fit wise, I found the Tailor4Less system interesting. As you enter your measurements, it provides guidance on the range of where your measurements should fall given information you enter about your height, weight, shoulder shape, torso, stomach etc. While the suit didn't fit perfectly when it arrived, this was totally my fault as I erred on the side of caution when I entered my measurements. Unless the person taking your measurements is making your garments or has a working understanding of how the tailor works, I've found that no two people interpret measurements the same way. My tailor once told me, "it's generally easier to bring most things in than to let them out", so I padded some of the numbers to give him fabric to work with. In the event that you enter the "right" measurements and aren't satisfied with the fit of the garment you receive, Tailor4Less offers a "Perfect Fit Guarantee" that states they will remake your item if you are not satisfied. They also offer an alterations refund for work that you choose to take to your tailor. I've got to be honest, this is one of the most impressive cases of putting your money where your mouth is. Tailor4Less wants you to be happy with what you get and it seems by and large, their customers are. Construction wise, things were a bit rougher around the edges than I expected when it came to some of the small details in the finishing. For example, stitching was obvious in some places where they shouldn't have been on the trousers such as the waist and belt loops. Fortunately, between the vest and the jacket it would be hard to see this and frankly, you would have to be looking as I was for these areas of opportunity. Pretty much every construction/finishing issue I noted would not be obvious without examining the suit closely (like turning it inside out) and none seemed to affect the structural integrity of the suit. However, both the brands I choose to work with and readers of this blog have come to expect a full, honest review and so I felt it important to point these things out. I reached back out to Tailor4Less and not only did they welcome this feedback but took it to their quality control folks for review which says a lot about them in my opinion. Tailor4Less offers the ability to create made to measure clothing and customize it in pretty much any way you can think of at a price that I've yet to come across another brand being able to - online or otherwise. The pricing of their custom suits starts at $269. They also deliver a finished product to your doorstep in two weeks. It would be unreasonable to expect perfection and I doubt most look over clothes through the lens of a reviewer. Tailor4Less is a fantastic option if you are building a wardrobe and looking to take the next step beyond what you can pick up at your local mall. If you don't already know them, find a tailor who can take your measurements for you as this gives you an opportunity to dial your fit it, order some fabric swatches and check out the 3D visualizer while you wait. 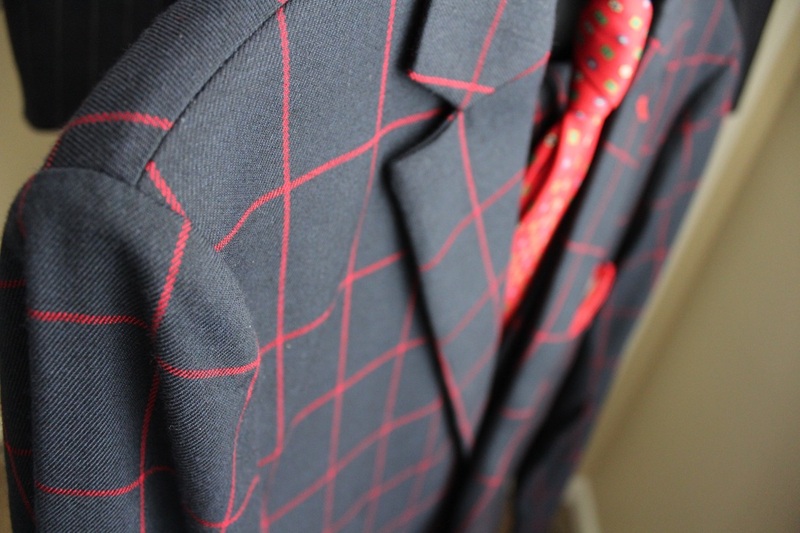 In the meantime, check out how I styled my red and navy windowpane suit here.